The second flight test of NASA’s Low-Density Supersonic Decelerator (LDSD) will be attempted on Tuesday, June 2 at no earlier than 1:30 p.m. EDT (7:30 a.m. HST), launching a rocket-powered, saucer-shaped test vehicle into near-space from the Pacific Missile Range Facility on the island of Kauai in Hawaii. The test launch window is from June 2-12. At launch time, a giant balloon will carry the test vehicle to an altitude of 120,000 feet (37,000 meters). 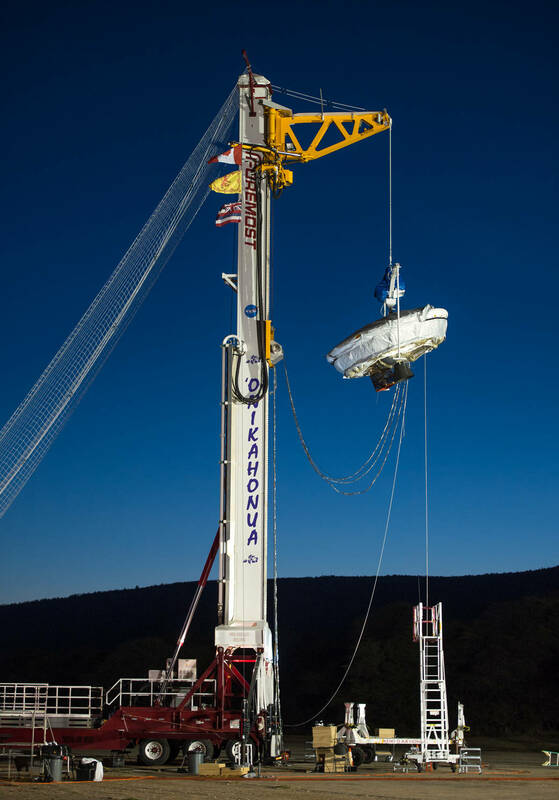 After release from the balloon, a booster rocket will lift the disk-shaped vehicle to 180,000 feet (55,000 meters), during which it will accelerate to supersonic speeds. Traveling at about three times the speed of sound, the vehicle’s inner-tube-shaped decelerator, called a supersonic inflatable aerodynamic decelerator, will inflate and slow the vehicle. Then, at Mach 2.35, its parachute will inflate and gently carry the vehicle to the ocean’s surface. The LDSD project, led by the Jet Propulsion Laboratory in Pasadena, California, and sponsored by NASA’s Space Technology Mission Directorate in Washington, is conducting this full-scale flight test of two breakthrough technologies: a supersonic inflatable aerodynamic decelerator, or SIAD, and an innovative new parachute. These devices potentially will help us deliver double the current amount of payload — 1.5 metric tons — to the surface of Mars. They also will greatly increase the accessible surface area we can explore, and will improve landing accuracy from a margin of approximately 6.5 miles to a little more than 1 mile. All these factors will dramatically increase the success of future missions on Mars. The LDSD project’s successful first flight test was launched on June 28, 2014. In this photograph, a full mission dress rehearsal is held for the LDSD project, Friday, May 29, 2015, at the U.S. Navy Pacific Missile Range Facility (PMRF) in Kauai, HI.